Richard Krech was born in 1946 and grew up in Berkeley, California. He became involved in civil rights activities in 1963 and started writing soon thereafter. Krech published a poetry magazine and organized a series of poetry readings at a bookstore on Telegraph Avenue in Berkeley from 1966 to 1969. 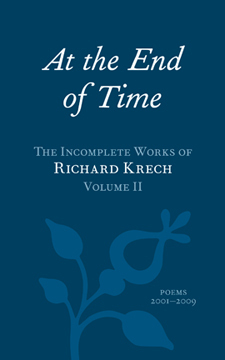 He authored several books, including The Incompleat Works of Richard Krech: Poems 19661974, and had numerous periodical appearances before he stopped writing poetry in the mid-’70s. In 1976 Krech went to law school and has been practicing criminal defense in Oakland, California since 1980. His practice has included everything from murder to shoplifting as well as pro bono representation of anti-war demonstrators and others similarly situated. He now has a primarily appellate practice. Krech began writing poetry again early this century. Since then he has had several books and numerous periodical appearances and a bibliography of his work was published in the summer of 2010. Krech has traveled frequently to Asia, Africa, Latin America, and Europe. He has three children, three grandchildren, and lives with his wife Mary Holbrook in Albany, California.